Lucy Barnett's team, who have been in scintillating form this term, beat Bletchley Ladies 68-7 at Newark RUFC in the Women's Championship North play-off on Sunday afternoon. "This is an amazing achievement," said Barnett. "I never would have thought three years ago that we'd go on to get promoted three times and find ourselves going into the Championship. It's been an incredible journey. "I still can't quite believe it, I don't think it has sunk in yet. I'm absolutely thrilled and so, so proud. "The girls have all worked so hard and they really deserve all their success. The coaches have been brilliant as well. Everyone involved has played their part." 'Gate took the Championship North Two title in emphatic fashion, winning every single one of their league matches, racking up 692 points in the process and conceding just 52. And they made similarly light work of Midlands Two champions Bletchley on Sunday, romping to another huge victory in what was the biggest game in their history. "We scored two tries inside the first five minutes which really set us up nicely, but it was a challenging game," Barnett added. 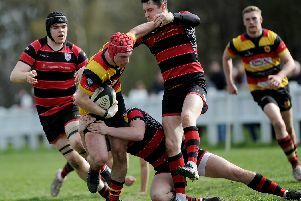 "Bletchley played well, they made it tough for us and we had to give it everything we had to come away with that result. "Sometimes the scoreline maybe doesn't always reflect how close the match was in periods, but our girls did play some outstanding rugby on the day." Barnett expects that much tougher tests lie ahead, but says her players will relish the challenge of competing at Championship North level next term. "We can't wait for next season, it will be a really good standard and we'll be up against some great teams," she continued. "It will be good for us. That step up will hopefully mean that we'll find our level and be playing in the right division. "Winning every match so convincingly this season and then the scoreline in the play-off game does probably suggest that we need to be playing higher up, so I'm thrilled that we now have that chance."